Cassie travels with just the essentials. First on the list: Luger, M-16, ammo, Bowie knife. Incidentals like food, water, sleeping bag, and nail clippers come further down. A nondescript 16-year-old, she is one of the very few people left alive on Earth. Aliens sent waves of destructive forces to eradicate humans: Cassie's family survived the 1st and 2nd Waves. Her mother died in the 3rd Wave (Pestilence) and her father in the 4th (Silencers). 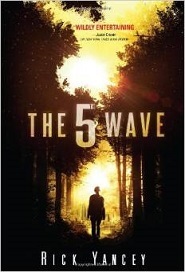 Her little brother may still be alive; he may even be safe in a military compound, as Cassie deals with the 5th Wave- a carefully orchestrated survival dance of kill or be killed. The aliens are never described in detail, and their reasons for wanting the humans gone are not clear.